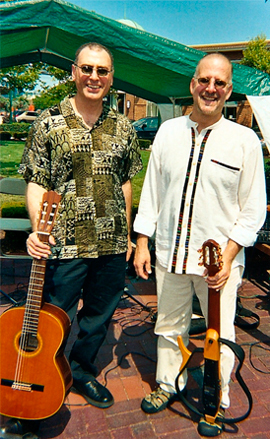 The FERLA-MARCINIZYN GUITAR DUO perform frequently for audiences of all ages at schools, museums, historical societies, clubs, festivals, and on community and church concert series. Their repertoire spans five centuries and includes music by traditional and contemporary composers as well as folk, jazz, and popular arrangements. John Hayes of the Pittsburgh Post-Gazette wrote that they "compile what is easily the most diverse set list in town." Andrew Druckenbrod, also of the Post-Gazette, reviewed a recent concert: "The Ferla-Marcinizyn Guitar Duo provided some education of its own with a survey of the repertoire of the guitar. . . including some animated lute transcriptions in which the duo expertly executed the imitation. . . . A Hindemith Rondo came across lively and punchy, and Brouwer's variations on Frere Jacques was masterful. The best piece, and performance, of the afternoon was Andrew York's Evening Dance, which created a fascinating mood using evocative harmonies and nimble runs."